Really these should be called Cupid Cookies. Because, let's face it... if you make these for someone, they are likely to fall in love with you (if they haven't already). They could also be called Crack Cookies, but that's not as cute sounding. And I'm all about cute. These are my version of a Kitchen Sink cookie (or a compost cookie, or a garbage cookie, or whatever you call them). As you know, I'm not a baker, but I made a New Year's Resolution to become better at it. I've made these now three times, slightly tweaking each batch to make them what I feel to be truly perfect cookies. And crack. They're very addicting. 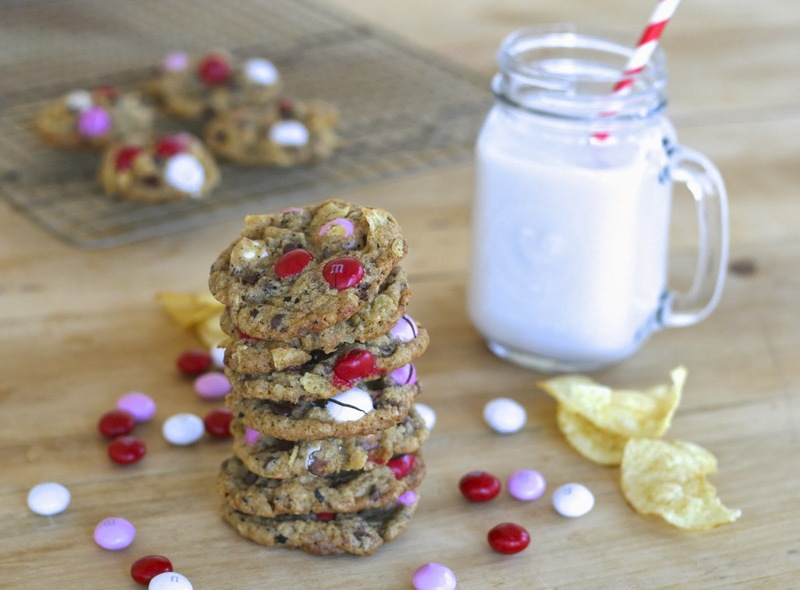 The best part about these cookies is they are very versatile. The whole "kitchen sink" concept is that you can basically find whatever sounds good from your cupboard and throw it into the batter. On the sweet side (left), I went with two chopped up Heath bars (thanks for the idea Laura Sylvan), Valentine's Day Peanut butter M&M's (I love all things PB), and mini chocolate chips from Ghiradelli. (Just for reference, the first time I did peanut butter chips and regular M&M's in Christmas colors). On the savory side (right), I did olive oil kettle chips (the chips sound weird, but don't skip this ingredient please), broken pretzel pieces (mini pretzels would've been cute if I could find some), and a few freshly ground coffee grinds (again, sounds weird, but so good). The first time I made them, I started with an adaption of the Momofuku Milk Bar Compost Cookie. To be honest, they were a little too crunchy for my taste, so I did a lot of research (this is a great post about how different elements affect the baking process) and made my own little tweaks along the way. 5.) REFRIGERATE THE DOUGH. For at least 24 hours. Trust me, this is very important. 7.) 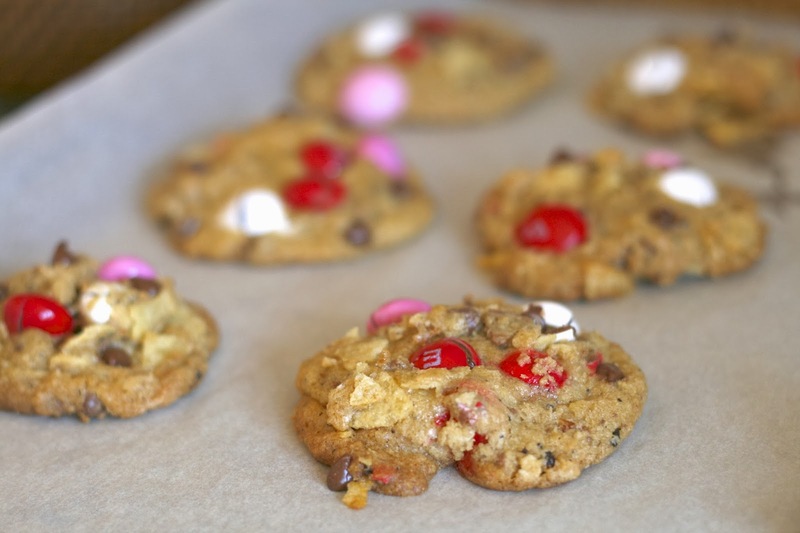 If using M&M's, gently press into the tops of the dough before baking to get a few pretty pieces on top. 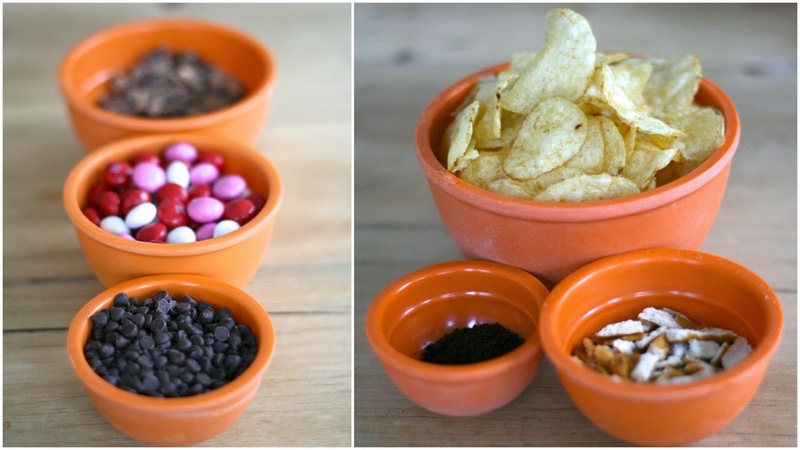 (You can do this with the chocolate chips too). My only gripe is that the M&M's always seem to crack. Perhaps adding them to the top halfway through the cooking time might help this, but it seemed like too much unnecessary work. Cracked M&M's are rustic, right? Rustic or ROMANTIC. 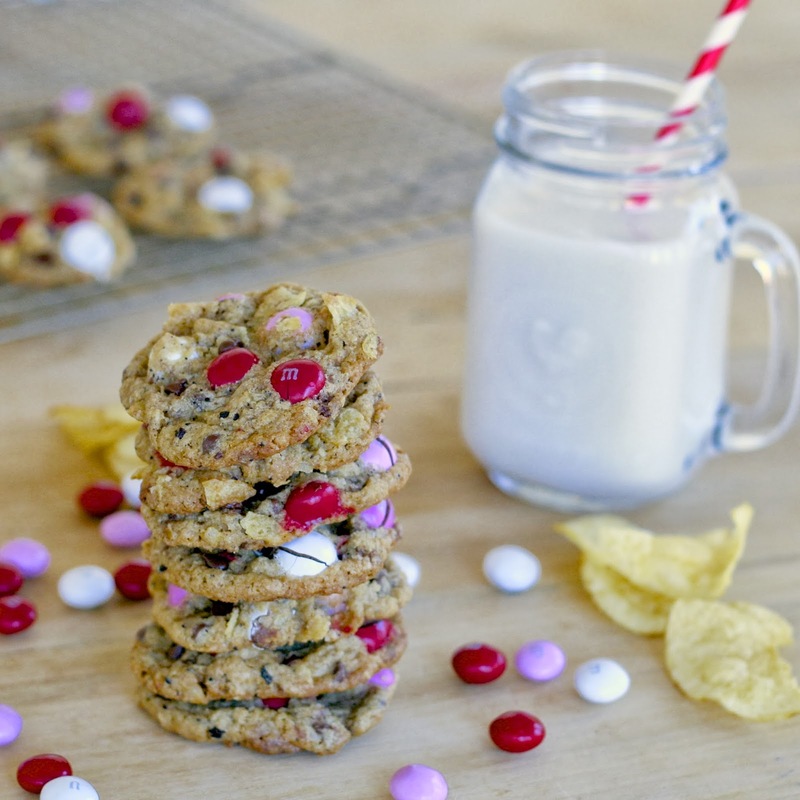 Either way, these Cupid cookies are sure to keep your Valentine coming back for more. Combine the butter and sugars in the bowl of a stand mixer fitted with the paddle attachment and cream together on medium-high for 2 to 3 minutes. Scrape down the sides of the bowl, add the egg, egg yolk and vanilla, and beat for 7 to 8 minutes. In a separate bowl, mix together the flour, baking powder, baking soda, cornstarch and salt. Reduce speed to low and add this mixture to the butter mixture. Mix just until the dough comes together, no longer than a minute. Scrape down the sides with a rubber scraper. Still on low speed, add the chocolate chips, heath bar bits, oats, and coffee and mix just until incorporated, about 30 seconds. Still on low speed, add the M&M's, potato chips and pretzels until just incorporated (just a couple of turns of the paddle). Be careful not to over mix or break too many of the potato chips. Using a 1.5 inch cookie scoop (about 2 tablespoons worth), portion out the dough onto a parchment-lined sheet pan. Pat the tops of the cookie dough domes flat and gently press additional M&M's and chocolate chips into the tops of the mounds. Wrap the sheet pan tightly in plastic wrap and refrigerate for at least 1 hour, but preferably 24-48 hours. 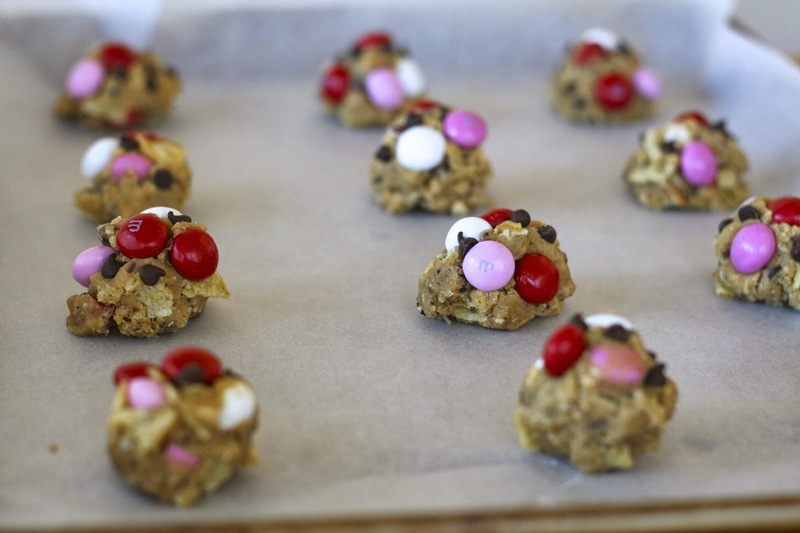 Place the cookie balls on a parchment-lined or silpat lined baking sheet, spaced about 2 inches apart. Bake for 10-12 minutes or until slightly browned on the edges. (They will appear undercooked in the middle when you take them out but they will firm up once they cool.) Allow to cool for 2-3 minutes on the baking sheet before transferring them to a wire rack to cool completely. *If freezing the dough, flash-freeze the dough balls on the parchment-lined pans. Once frozen, transfer to an airtight container or freezer bag. They will need a few extra minutes in the oven once you bake them, but otherwise they should cook up just the same! I LOVE that you are baking! I'm making these for my coworkers next week! We work nights and sometimes it's really hard to stay motivated when it starts to get late, but having something yummy like this will put a bright spot in our evening! Sounds like a great idea Megan! Let me know how they turned out! YUM! Not only would these cookies be hard to stay away from, but having all those tasty ingredients in the house might be a recipe for gluttony. but... I think I have to make them anyways because they look insanely delish. nicely done! You should make these for you family. I mean, like do it today.